torso and back of head of cloth. Lucille's gown is made of three layers: a burgundy lining fabric is the bottom layer. Next is a red sequined fabric. Over that, the top layer, is a sheer fabric with metallic threads. I wanted the dress to appear beaded. I felt this combination of fabrics accomplished that look. 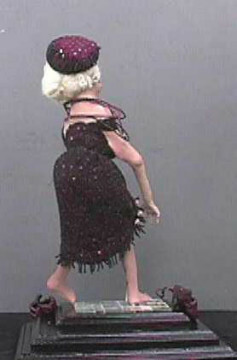 The dress had to be sewn and styled on Lucille, as the body design, especially the legs, would not allow a sewn garment to be put on her. 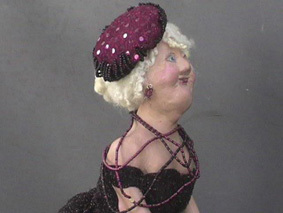 I have dabbled with polymer clay off and on over the years but have never made a polymer clay doll until Lucille. I thoroughly enjoyed making her. My booth has won awards at craft shows, but this is the first award I have won for an individual piece. I really did not believe she would fit into the challenge category and almost did not enter her. Sherry encouraged me to enter and just enjoy the process. I did (both)! Inspirations: I have worked as a senior day care activity coordinator. Remembering the looks on the ladies as they danced to tunes they loved is what inspired the creation of Lucille..
Herstory: There she was at the Grand Hotel again. The ballroom was not as palatial as she remembered. How many years had it been? Why try to calculate. It was a lifetime ago. The old hotel had been refurbished, funded partially due to the bill Edward had worked so hard to get passed. This Gala grand-re-opening was dedicated to him. Did he ever know how proud she was of him. They would come here and dance until the band refused to play another song. He had just passed the bar when he proposed right there on the dance floor. It wasn't long before they had little time for dancing--his practice and then the campaigns took so much of his time. And, of course as a senator's wife she was expected to act like a proper lady. What a bore, but then it was for Eddie--- ah-- Edward. She would do anything for him. The band began to play. Oh! they were playing the old songs. Her feet couldn't help but tap to the beat. But those youngsters, try as they might , they really didn't get the steps right. Eddie could have shown them how. No one could cut a rug like Eddie! She was having a hard time sitting still. Then it happened. The song they loved. Why they had won so many contests dancing to it! She would no longer sit there. Dropping her shawl by the table and her purse a few steps later, she darted to the dance floor. Oh who could dance in those old lady shoes? She kicked them off as she made her way to the mirrored platform. She grinned wondering if anyone could see her black lace undergarments or red satin garters reflected in the mirrors. So much for being a proper lady! But oh, Eddie wouldn't mind, would he ?She smiled and glanced heavenward. "Oh, Eddie, this one last dance is for you!" 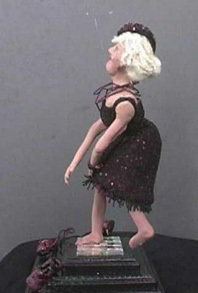 Once again, not strictly a fashion doll, but who could resist the sense of humour, the pert little face and bare feet? 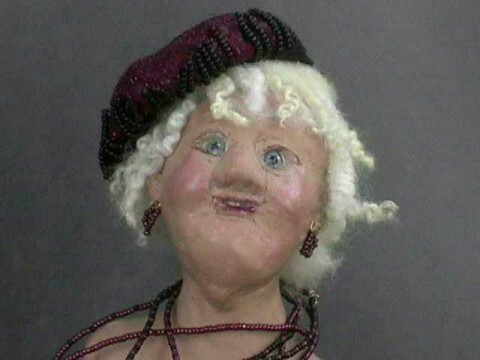 You really captured that little old lady look I see in the mirror every morning! Congratulations Alice, we expect to see more of your work soon.